New novel ‘Eric is Awake’ imagines George Orwell roaming the streets of contemporary London on a bike pursued by the Security Services for identity fraud. London, UK – With ex-National Security Agency analyst Edward Snowden revealing all about the NSA and GCHQ systematically gathering vast amounts of phone and web data, the words Orwellian and Big Brother are the default currency for articles on surveillance and an encroaching secret state. Journalists are forever speculating about what Eric Arthur Blair, under his famous pseudonym, would have made of contemporary Britain. Dom Shaw’s debut novel sees Orwell dying alone at night in University College Hospital on January 21st 1950 and awaking in the body of a homeless man on a snowy night in contemporary north London where he rapidly finds himself arrested, sectioned and finally released into bed and breakfast accommodation in Hackney supported by welfare benefits. 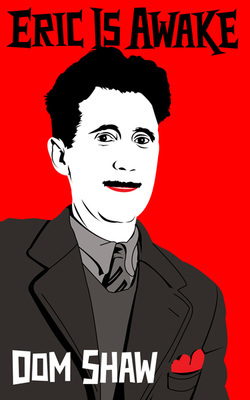 Orwell was once described by poet Paul Potts as ‘Don Quixote on a Bicycle’ and when Eric becomes embroiled in a dispute over his identity, he goes back on the tramp with a fellow traveler on a ramshackle bike borrowed from his psychiatrist’s brother.